The ACBL is the North American organization in charge of promoting, growing and sustaining the game of bridge and serving the bridge-related interests of its members. 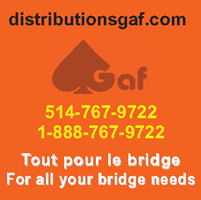 Joining the ACBL is the most concrete way of reaching all Montreal Bridge League players. By joining the ACBL, you automatically become a member of the League. Find out about the benefits of being a registered ACBL member and the registration process. The ACBL also manages game regulations, certifies clubs directors and bridge teachers and recognizes the achievements of its members with its masterpoints program. For more information, visit the ACBL website. On the ACBL website, a link gives you access to your account. On your first visit, you will need to register.